For his friend's 50th birthday, builder (and dear old friend of mine) Peter Abrahamson put together what might just be the most awesome birthday present ever. 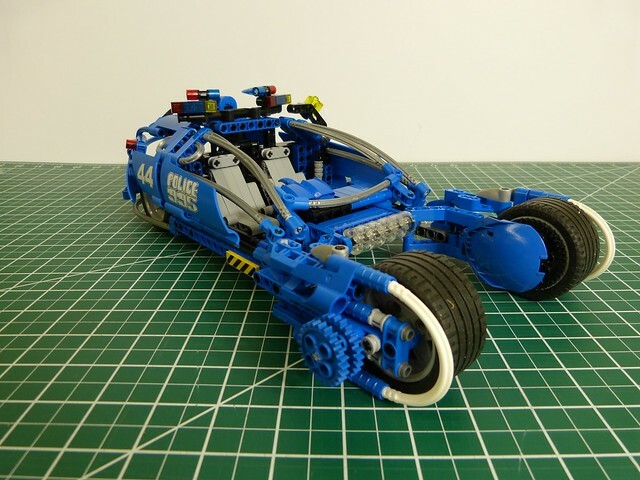 This is a recreation of a custom one-off Bladerunner Spinner that LEGO built for production designer and legendary artist Syd Mead. Not only that, it's with a custom framed license plate from the movie! The Spinner that LEGO built was unique because of some non production color parts used. It was actually featured in a detailed account by Joe Meno for BrickJournal issue #28 and featured right here on BrickNerd way back in 2014. Joe provided Pete the digital model he reverse engineered, which Pete gratefully acknowledges he couldn't have done it without. Some of the flex tubing used was never in production in blue, as well as the part on the inside of the front wheels. Pete got around this problem on the front wheels by using parts that were spray painted (I can hear you purists gasp, it's gonna be ok) by a friend. And for the flex tubing Pete substituted gray tubing instead, which looks just fine. Pete also custom printed water lift decals for the model which were painstakingly cut and applied. This was a real labor of love. Even the back of this thing is beyond awesome. To support the model on the frame, Pete custom built a frame back with a connecting beam at the bottom. Check out that custom waterjet cut Bladerunner detail in the middle! So, an actual prop from the movie and a faithfully recreated custom LEGO model all in a totally cool custom frame. You have to agree, this is about the best present ever. I'm sure Pete's friend will be proudly displaying this unique work of art and love for years to come.